When we hear the word resume, there is a sense of importance and a sense of defiance toward writing one. 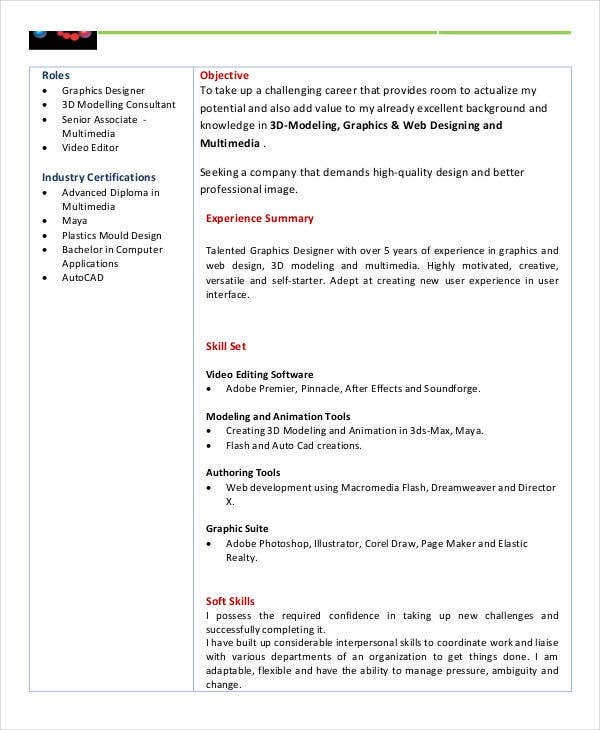 A resume template is considered one of the most important documents you will ever have in your lifetime. It is a key that opens a door to life-changing possibilities. 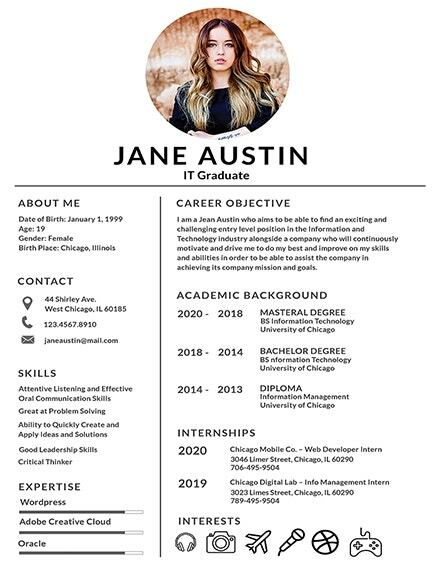 At some point in life, we are all beginners in writing a resume—even the most experienced person still have a hard time in writing one. 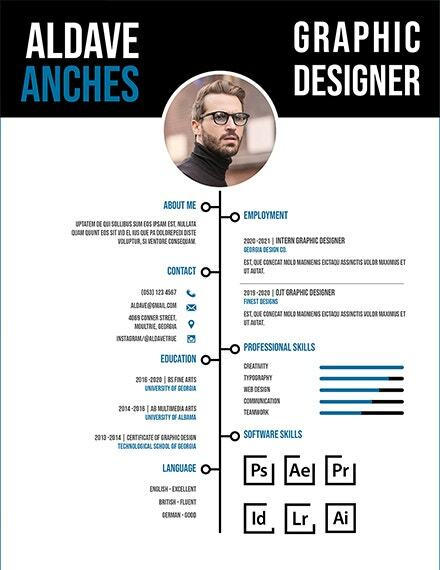 Whether you are experienced or inexperienced, it is always important to have a concise Resume Format. It is an essential tool in getting a head start into adulthood, after all. For Whom Is This Article? When we say fresher, it is usually a term for those who are fresh graduates or someone who just started. In this case, term is locked on toward those who have no experience in being a member of the workforce. It can also be someone who has no relevant working experience in the role they are currently or hoping to apply for. 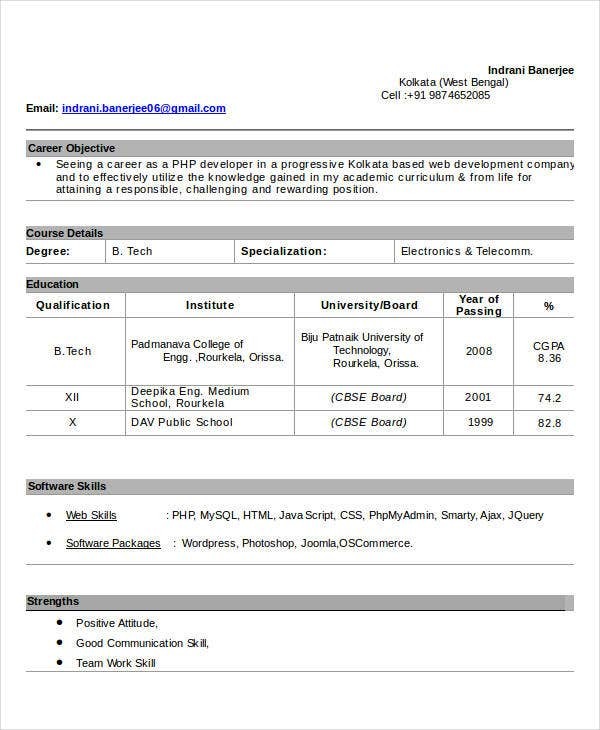 Check out BPO Resume Template if you are trying to enter the BPO industry for reference. 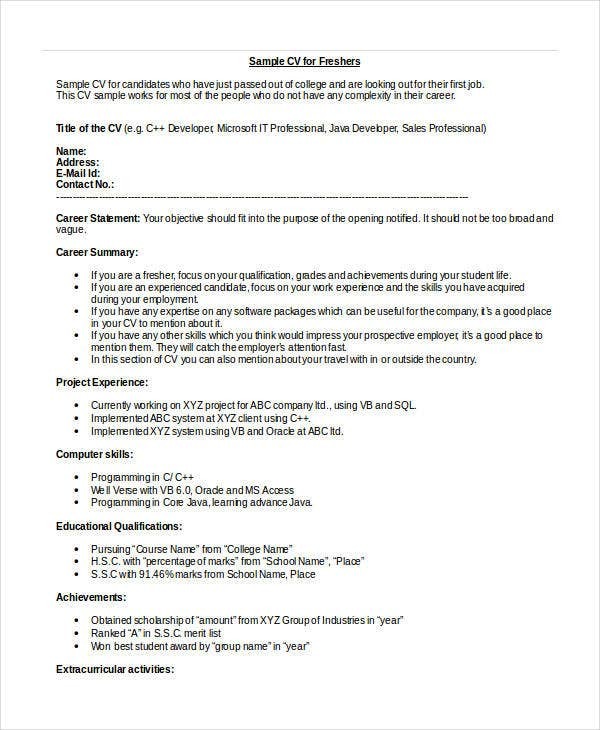 For someone inexperience or is lacking experience in the workforce, your sample resume would be missing one of the key points that a potential employer looks at. There is no need to worry about that since you will be able to fill that missing part eventually, and in order to do that is by getting a job. For you to be able to get a job, you will have to make sure that your resume is accompanied with the relevant documents that would support every details you have written down. You should also remember that employers does not only considers working history but also the capabilities and attributes of an applicant. So don’t stress out so much. 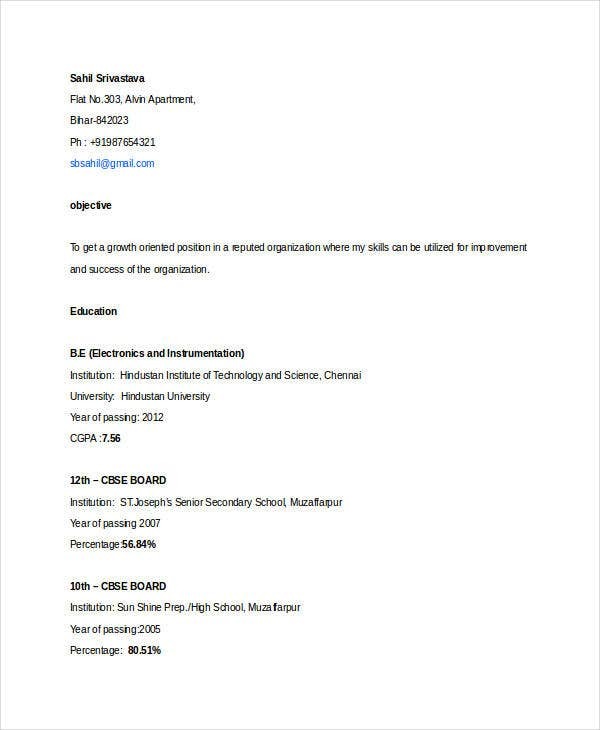 You may also see Professional Fresher Resume. Your objective must be able to communicate a glimpse of who you are as a person. Indicate your smart goals and what you would aim to achieve when you get the job. Without any prior working experience or anything related to the role you are applying for, implementing a little summary of skills you have attained while still in studying that is relevant to the job would highly help. 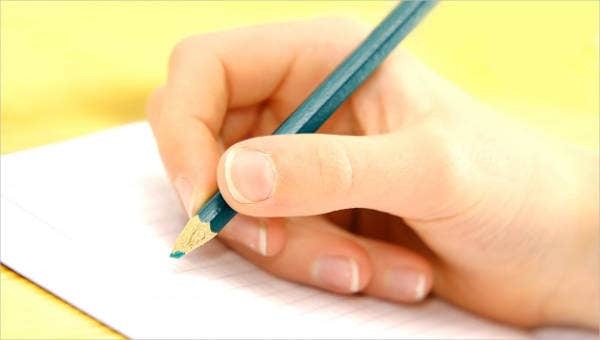 When writing down your educational background, it is preferable if you write it in a bulleted layout in ascending order based on the years you have attended. Indicating achievements you have achieved during those years will show how you are as a person in academic and public community. Strengths and skill sets will help your employer understand more of what you can contribute to their needs for the open position. Keeping it simple, direct to the point, without being superfluous, contributes greatly in a well-made resume. 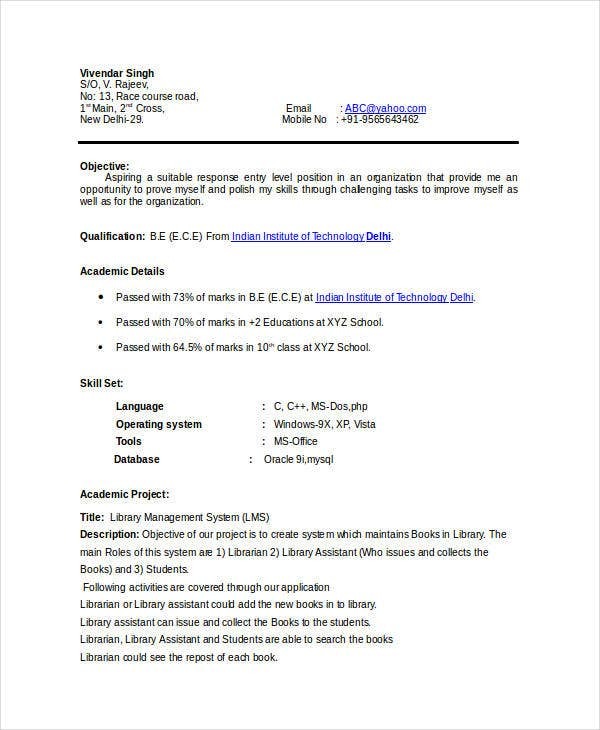 You may also see Modern Fresher Resume Templates. 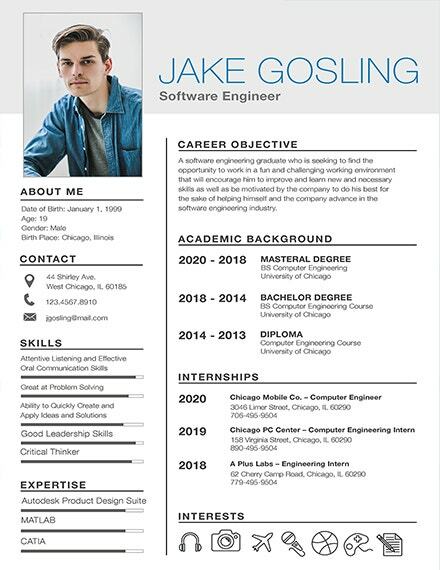 Writing a Basic Resume Template is not a small feat as it takes time a ton of preparations. If you are having a hard time in writing one, above are samples and more from our website are provided for you to download for free and use as a reference material.